The ergonomic handle with a hole makes the slicer easy and comfortable to hold and carry. With its balanced weight, the model doesn't wonk or wiggle. Its movements are tight but efficient. The wires are practically impossible to break. 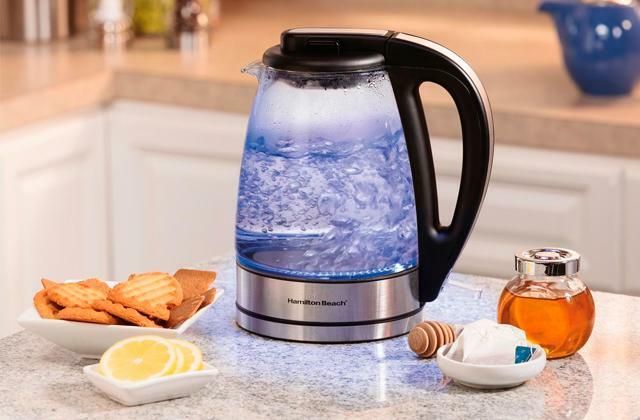 This multipurpose model from Westmark is the best option in this review for people who'd take quality and efficiency over a sophisticated design any day of the week. Though about as simple as a slicer like that can get, the model is surprisingly versatile and really sturdy. 7" x 3.8" x 1.5"
A couple of side handles make it really easy to slice the eggs accurately and precisely. Aside from slicing, you can use it to wedge and half eggs, fruits, and vegetables. The compact slicer is a cinch to store in a drawer. The wires lose their strength over time. 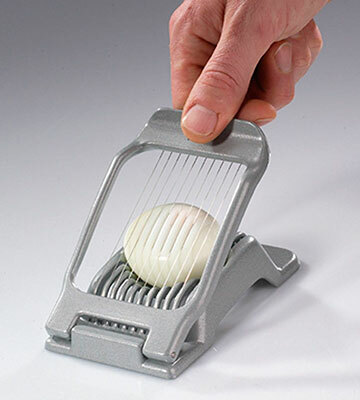 This Progressive egg slicer is the perfect tool for people who like to experiment in the kitchen. 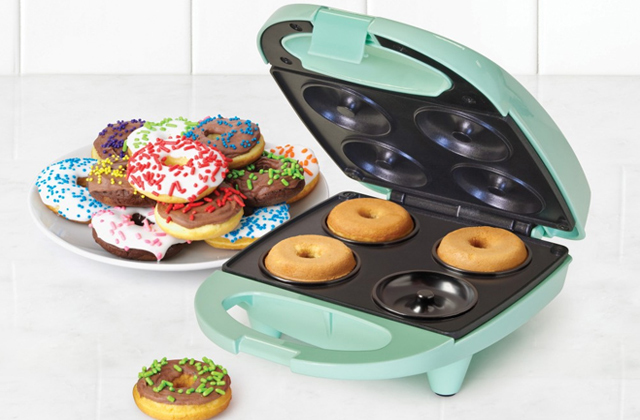 With it, you'll be able to prepare your eggs, as well as a variety of other food items and ingredients, in a lot more ways than one. 4.1" x 3.5" x 2.2"
The relatively thin stainless steel blades (wires) allow you to cut your eggs into perfect slices every single time. The lightweight but surprisingly tough ABS plastic construction, along with the foldable design, makes the slicer an excellent travel tool. Though it is dishwasher safe, hand wash is highly recommended. 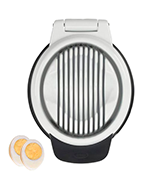 Mainstay 33112 is an egg slicer we could easily recommend to those who don't like spending a whole lot of time in the kitchen or dropping a lot of money on kitchenware but would still like to be able to quickly cut hard-boiled eggs and prepare healthy snacks. 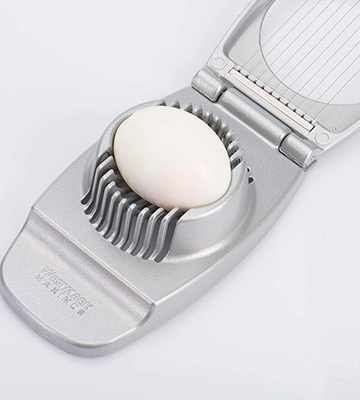 The egg slicer is backed by a 5-year warranty. You can fit it into any drawer. The stainless steel wires are individually mounted. 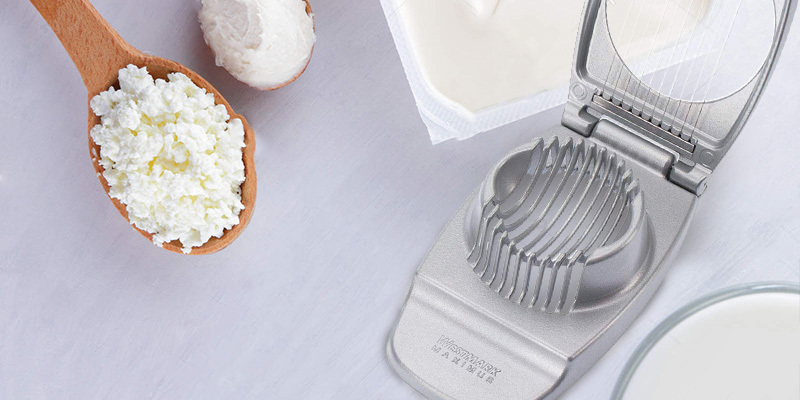 The easy-grip raised handle is a cinch to lift and push down, making it equally easy to get that clean and even cut every time you use the slicer. Difficult to fit some of the more sizable eggs. 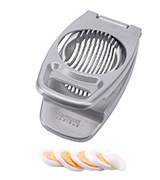 Westmark Duplex gives you the usual German engineering perks like a sturdy, high-quality construction and a simple design but also a slightly less traditional and a lot more functional approach to the usual egg slicer formula. 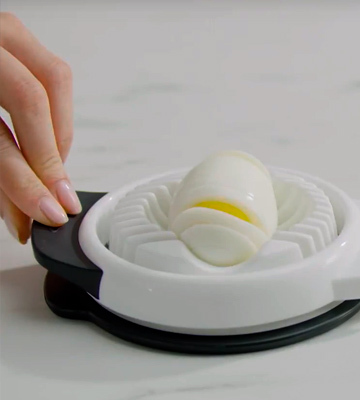 It lets you effortlessly slice hard-boiled eggs into even 5-millimeter slices. 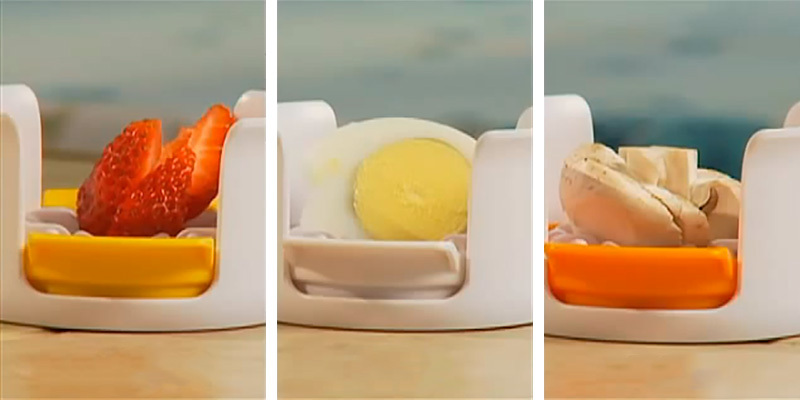 The model "cradles" eggs in two directions, meaning that you can choose between round and oblong slices. It is top-rack dishwasher safe. The non-slip base isn't as non-slip as advertised. OXO Good Grips 1271080V1 is a great egg slicer provided you are not looking for the most versatile model out there. It won't let you cut most fruits and vegetables but, when it comes to cutting and slicing eggs and mushrooms, this is as good of a tool as the next model. 5.75" x 4.25" x 1.25"
This multipurpose slicer from Westmark is German engineering at its finest: simple, efficient, and effective. The base and the handle made of cast aluminum are as durable and robust as it gets. They are also rust- and corrosion-resistant, which is always a plus in our book. Aluminum is almost always dishwasher safe and this product is no exception. Having said that, your average dishwasher won't always be able to fully clean this tool, so there's a decent chance you'll have to clean it yourself afterward. The wires are no joke either. Comprised of high-quality stainless steel, they're sharp and sturdy. The "stainless" part also makes them practically immune to rust. The construction is as simple as it is efficient. 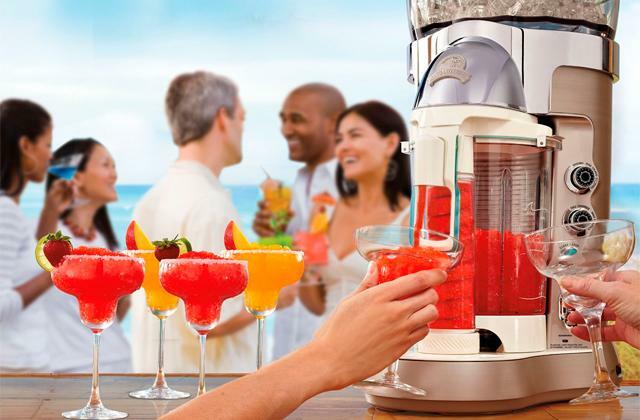 There's an ergonomic handle with a hole that makes the slicer easy and comfortable to hold and carry. The model doesn't have a huge non-skid base but it does have finger support, so you'll be able to keep it in place. One of the things that makes this product such an excellent slicer is the balanced weight. It doesn't wonk or wiggle. The tool's movements are tight but efficient. And, again, the wires are practically impossible to break, so you can use them on anything that needs slicing. 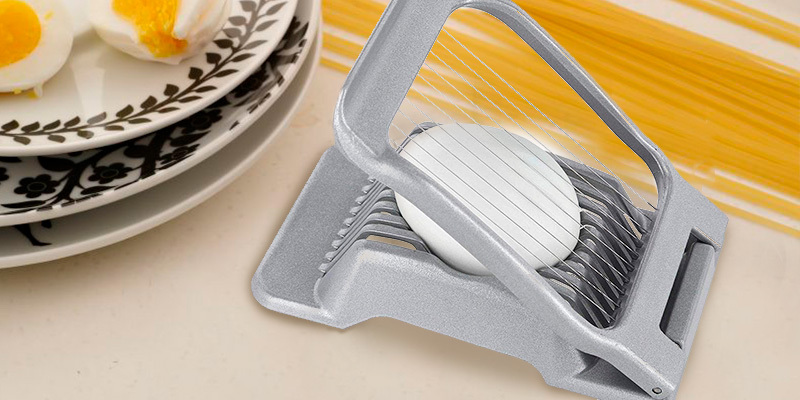 Bottom line, this multipurpose model from Westmark is the best egg slicer in this review for people who'd take quality and efficiency over a sophisticated design any day of the week. Though about as simple as a slicer like that can get, the model is versatile enough and its robust construction makes it a good long-term investment. This compact slicer from Progressive is a little odd. Simply put, it looks like a cheap piece of plastic, which is odd considering just how quality of a cookware piece it actually is. The model's large non-skid base stays in place. It doesn't wobble, shake, or slide around. You don't have to support it yourself. A couple of side handles make it really easy to slice the eggs. Speaking of which, the list of food items that the tool is capable of slicing includes but isn't limited to eggs, mushrooms, most vegetables, strawberries, kiwis, and the majority of soft fruits. The only fruits and foods that it won't be able to slice are the ones with a really hard shell. That's really the only issue we have with this product. Since the wires are a little thin, you can't use them to slice harder ingredients. Plus, they lose their strength over time. That being said, the wires and the overall design make this model one hell of a versatile tool. Aside from slicing, you can use it to wedge and half eggs, fruits, and vegetables. 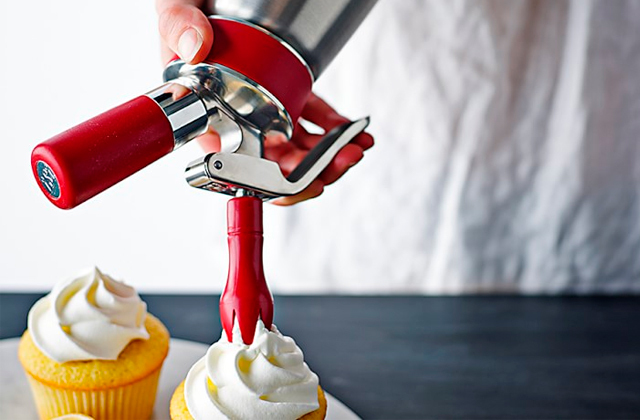 It is the perfect tool for preparing deviled eggs. Maintenance-wise, the compact design makes the slicer easy to store in a drawer and its plastic composition makes the whole thing completely dishwasher safe. 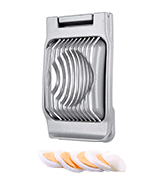 In other words, this compact Progressive egg slicer is the perfect tool for people who like to experiment in the kitchen. 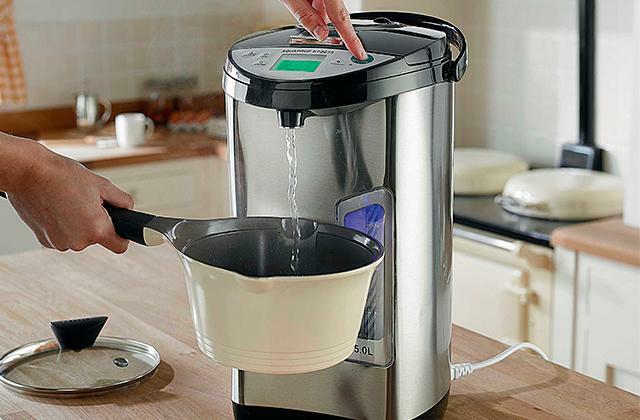 With it, you'll be able to prepare your eggs, as well as a variety of other food items and ingredients, in a lot more ways than one. Mainstay 33112 is by far the most budget-friendly option on this list. You can get a new one for less than 5 bucks. And, for the most part, there's really no downside to it. Well, there's a thing or two but nothing to really complain about. Though it is dishwasher safe, the people behind this slicer highly recommend hand washing it instead. The relatively thin stainless steel blades (wires) and the size/design of the tool allow you to cut your eggs into perfect slices every single time. But the same wires and design make the model unsuitable for anything other than eggs and mushrooms. However, again, these very same characteristics, as well as its lightweight but surprisingly tough ABS plastic construction, also make the slicer an excellent travel tool. Since the whole thing adds up to just 5 x 4 x 1 inches in overall dimensions, you should always be able to find enough space/room for it, especially considering that the slicer is also foldable. Apart from that, there's really not much to say here. The plastic is BPA-free, so that's nice. 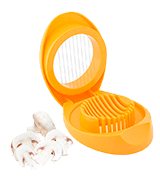 A little finger support lets you comfortably hold the tool as you slice eggs and mushrooms. 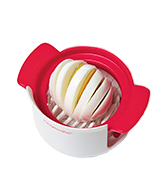 All in all, Mainstay 33112 is an egg slicer we could easily recommend to those who don't like spending a whole lot of time in the kitchen or dropping a lot of money on kitchenware but would still like to be able to quickly cut eggs and prepare healthy snacks. Westmark Duplex is another multipurpose slicer from the German company and another product that more or less excels in every category. The only gripe that we have with it is the size. On one hand, the fact that the whole thing adds up to just 5 x 3 x 1 inches in overall dimensions is great. It makes the tool small enough for any drawer, no matter how small and cramped. The thing is, it also makes the slicer a little too small for some of the more sizable eggs, seldom a huge issue but something that might concern a customer or two. Other than that, backed by a 5-year warranty, this is as quality of an egg slicer as they come. The cast aluminum body is sturdy and reliable. The stainless steel wires are individually mounted. But, first and foremost, the model delivers on the practicality front. Fitted with an easy-grip raised handle, it is a cinch to lift and push down the wires, making it equally easy to get that clean and even cut every time you use the slicer. 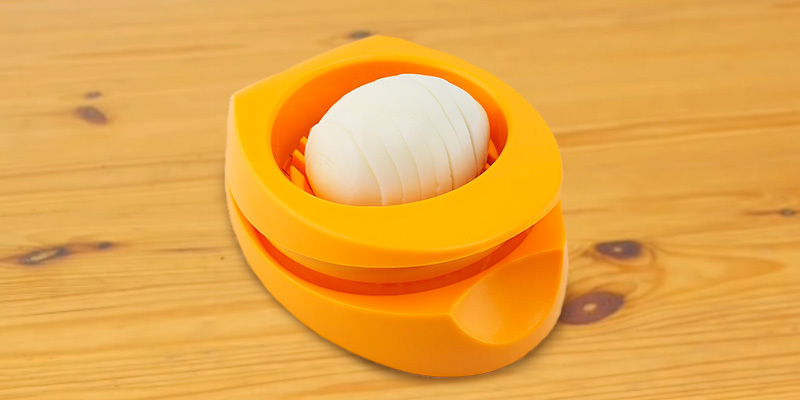 The tool cuts eggs into oblong pieces as well as it makes perfectly round slices, so you'll be able to enjoy a nice egg salad or hard-boiled egg snacks. 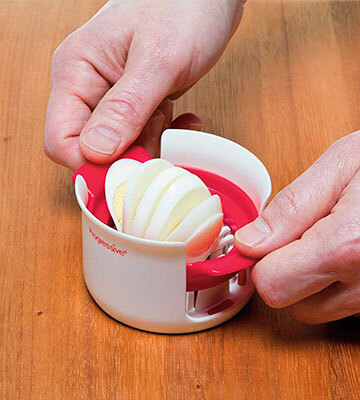 All things considered, Westmark Duplex gives you the usual German engineering perks like a sturdy, high-quality professional construction and a simple design but also a slightly less traditional and a lot more functional approach to the usual egg slicer formula. OXO Good Grips 1271080V1 has to be one of the most convenient and probably the most attractive tool here. Of course, the latter is generally not the quality we look for in cookware but it is always nice when it's there on top of functionality and utility. 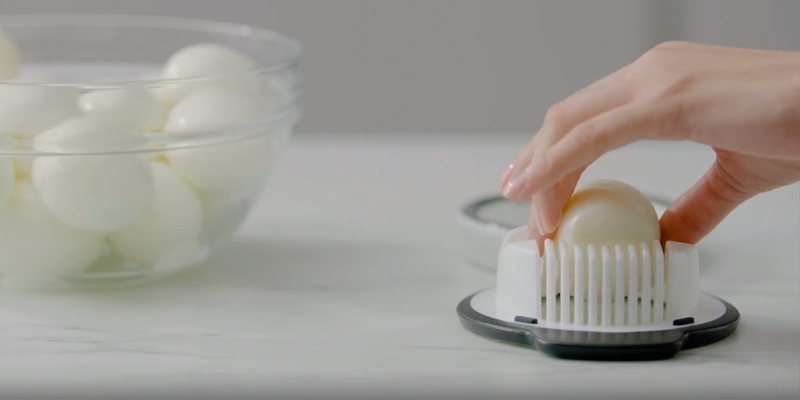 With this model, you'll be able to quickly and effortlessly slice hard-boiled eggs into perfectly even 5-millimeter slices. On top of that, the slicer "cradles" eggs in two directions, meaning that you can choose between round and oblong slices. The model's overall construction is simple but effective enough. 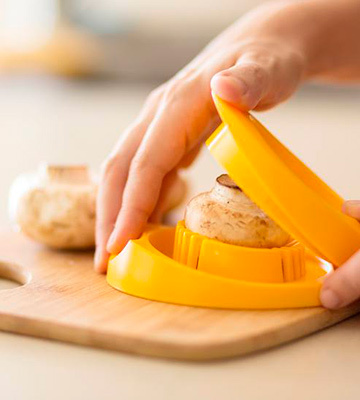 It won't allow you to cut most fruits and vegetables but the tool is perfectly suitable for mushrooms and, of course, eggs. More often than not, its non-slip base gives you a comfortable and stable grip when slicing over a bowl or plate. That being said, it isn't exactly as "non-slip" as advertised, so we would still recommend you to proceed with caution. On the bright side, the ergonomic raised handle makes it easy and comfortable to open and close the slicer. The tool is also top-rack dishwasher safe, so maintenance won't prove too much of a hassle. Taking all of that into account, OXO Good Grips 1271080V1 is a great egg slicer provided you are not looking for the most versatile model out there. Again, it won't let you cut most fruits and vegetables but, when it comes to cutting and slicing eggs and mushrooms, this is as good of a tool as the next model. What Is an Egg Slicer? Eggs are delicious and, for the most part, as healthy as any food item can get. Plus, you can cook them in so many ways, including but not limited to hard-boiled, soft-boiled, hard-scrambled, soft-scrambled, poached, sunny side up, baked, shirred, basted, omelette, frittata, you name it. Some of these can be a bit of a chore though. That's why cookware like egg slicers have been rising in popularity recently. Using a tool like that, you can perfectly and effortlessly slice an egg into a bunch of thin pieces. On top of that, your average slicer can do quite a bit more than just chop up eggs. 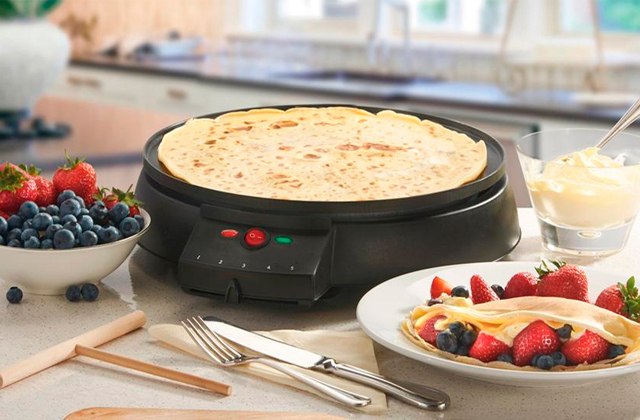 With its help and, depending on the model, you'll be able to slice mushrooms, boiled vegetables, strawberries, kiwis, and other soft fruits. Generally speaking, the design differences in various models are minimal but the difference that they can make is sometimes quite noticeable. So make sure to read our reviews and you should be able to figure out the right pick for you.